Nihuo Web Log Analyzer provides comprehensive analysis of the activity of customers that visit your web site. It can generate a wide range of reports and statistics from your log file - more than 80 different reports with 2D and 3D graphs. Reports that tell you: How many visitors came to the web site; How visitors browse your web site; Where visitors come from; Which pages they viewed and which ones they ignored and more. Other features include: Visitor filters and hits filters; Automated scheduling; Auto detecting log file format; Stolen object statistics and more. Analyse Spider can provide you with reports and statistics about visitors to your Web site. This tool can also help you to see if your Web site promotion is paying off, when you should update your Web site, and which errors occurred on your Web site. It offers a way to produce professional Log Reports from your raw log files or read Gzip-compressed log files. You can see which check if they have spidered all your pages, it can identify spiders, Analyse Spider uses an internal IP mapping technology that identifies a visitor's geographical region by their IP address. eIQ Professional Suite is a multi-purpose server log analysis and reporting software. With eIQ Professional Suite, you can analyze log files from your HTTP, FTP, proxy and streaming media servers. Additionally, the monitoring feature allows you to monitor your local and remote servers/networks. You can gain insight into crucial statistics that will help you analyze critical geographic and marketing trends on your Web/FTP/proxy/streaming media servers. SurfStatsLive Reporting Service is a Windows 2000/2003 server-based web analytics product. Web Hosts and Service Providers can provide browser-based on-demand Website Statistics reports for clients with this tool. The program can generate reports down to sub-directory level and can also be set up as a Statistics Bureau for clients with no log files. SurfStatsLive can read various log file formats. The log files can be located on the Windows Web Server it is installed on or from other Web Servers on the Local Area Network. IIS Web Sites can be imported to speed up site profiles set up. Reports can be generated in most major languages and more languages can be added with the free Language Editor. A visual approach to understanding how visitors interact with your website. Fundamentally different website analytics that displays visitors behavior in context with the site itself. Ideal for right-brained thinkers and those who are tired of long tables of numbers produced by other analytics software.Your actual HTML pages are displayed overlaid with data that visually shows how many people navigate any link. ClickTracks works by importing the web server log file. It supports Apache and IIS web servers among others. 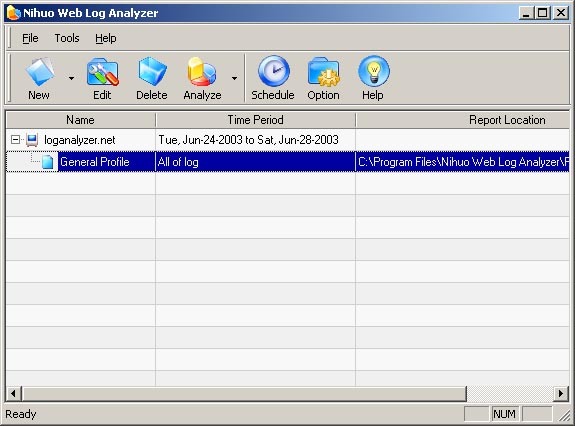 SurfStats Log Analyzer analyzes web server log files and generates 50 html web activity reports in various languages with report output to screen, file directories, ftp or email. It supports most common log file formats with automatic log file format and compressed format detection. It comes with all the necessary tools designed to automate and simplify log file analyzing like a FTP client, E-Mail client, Scheduler, File viewer, and more. A comprehensive Web/FTP site Reporting and Log Analysis Tool, eIQ LogAnalyzer visually shows the "who, what, when, where and how" of eVisitor sessions on your Web/FTP site, featuring support for multiple server log files and ODBC database compliance. Create and save any number of custom reports and apply over 100 pre-processing, post-processing filters and query level filters. Graphical reports provide valuable information that reveal critical statistical, geographic, and marketing trends.